Escape from the weary troubles of your day-to-day and bask in the laid-back island vibes of everyone's favorite beach bum, Jimmy Buffett! 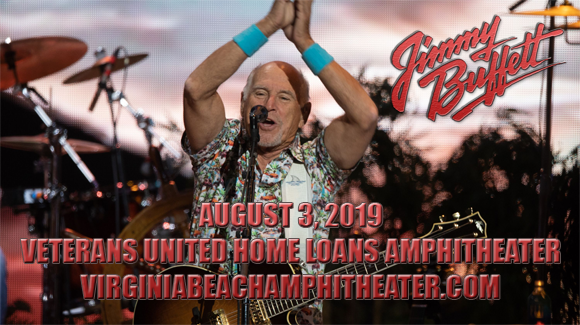 Headed to Veterans United Home Loans Amphitheater on Saturday 3rd August 2019 (backed, as ever, by his faithful and talented Coral Reefers), Jimmy is on his Son of a Sailor Tour, continuing the 40th anniversary celebration of his beloved 1978 record! Get ready to sip your margaritas and enjoy hits like “Cheeseburger In Paradise,” “Livingston Saturday Night” and “Cowboy in the Jungle” as the treasured performer gets the party going! Known for his easygoing, folk-country music (coined as Gulf and Western) and genial beach bum persona, American singer, songwriter and musician Jimmy Buffett has been a popular touring musician for over 50 years. Influenced by his love of the sea and island life, Buffett's cheerful, anecdotal songs, such as "Margaritaville" (ranked 234th on the Recording Industry Association of America's list of "Songs of the Century") and "Come Monday", and dedication to touring have amassed him a devoted fanbase known as "Parrotheads". His entertaining live shows are notorious for playful audience participation and Buffett's colorful and amusing stories. Over the years, Buffet has released 27 studio albums, 14 live albums and 67 singles. In addition to his prolific discography, Buffett is involved in several successful business ventures, including two restaurant chains named after two of his best-known songs (the Margaritaville Cafe restaurant chain and the Cheeseburger in Paradise restaurant chain) and involvement in beer production, casinos, football, video games and real estate. He is also a best-selling author and has several film music credits and cameo appearances to his name.